Rishi Vohra recently relocated back to Mumbai after completing a Green MBA from San Francisco State University and a Masters Diploma in Environmental Law, prior to which he had a successful career in the Indian Entertainment Industry. After featuring as a guest columnist for various newspapers in India, he currently writes for delWine and is a Certified Specialist of Wine (CSW). 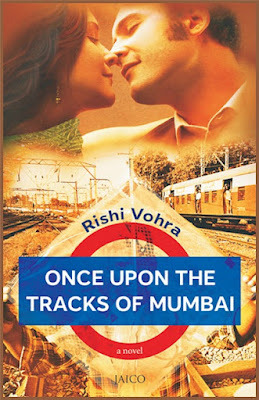 'Once Upon the Tracks of Mumbai' is his first novel. “Autistic, schizophrenic, psychotic,” are the words people use to describe Babloo, but the problem is that no one understands him, no one talks to him and no one gets what he feels. No one treats him well expect Vandana, his love interest. He has no relationship worth mentioning with anyone else. He lives in the railway colony in Mumbai and dreams of making something of his life, but his lack of understanding when people talk to quickly and the constant disapproval of his parents lowers his spirits. The story moves ahead with so many unpredictable twists and turns which keep the readers h0oked. Which incident changes Babloo’s life completely? How does he becomes the superhero Rail Man? How does his life change when he becomes Rail Man? Does his mental condition come in the way of his love? Does he get the coveted hand of Vandana or does he let her be taken by his Sikander who covets her as well. Can he teach Sikandar a lesson? Will life be the same again for Babloo? Read the book and you shall get your answers. Not just the answers: but a smile on your face as well. Its the innocence in the writing that will touch you. Babloo is someone who will touch your heart from page one . Think from the view of a autistic person, a person who is not good at expressing himself. Someone who can not convey emotions, love or even his views. Babloo is intelligent but no one sees him for what he is. Its a beautiful story. As a first time author, Rishi Vohra has done a quite a good job. (Also I have had the chance to speak to him over emails and he's a really sweet guy) . The story is fresh and refreshing. I say it repeatedly, given a choice I never pick a romantic book (Especially by Indian Authors..yes go ahead narrow your eyes but its true) . But I don't regret reading this one bit. The character sketching is spectacular and grammar nazi is not too annoyed as well. I like attention to details, not descriptive essays about the scenery but the small things that make you smile, think or ponder and these are the things that stay with you. The book is good. If you are looking for mush, you will be highly disappointed. But if you want to read something that leaves you with a fuzzy warm feeling, then grap your cup of tea and sit by the window with this sweet story. Thank you for the review! Appreciate your kind words.